On Monday evening, I stood on our front porch contemplating the vegetation growing up between the spreading interlocking bricks on the steps. I wasn’t looking forward to hunkering down with an old kitchen knife to pry the tufts out piece by piece. Oh, I’ve tried the agricultural vinegar route – all it did was make everything smell like the remnants of a french fry fest for a couple of days. The weeds just laughed it off. I was contemplating making a run to Quebec to buy some Killex when I noticed a handful of buzzy creatures zipping in and out of a spot by the rhododendron bush. I got a flashlight. Stepping in for a closer look, I realized that they’d chewed through the black fabric and burrowed underneath. Yellow jackets – those pesky things that land on your food or try to swim in your glass of wine as you eat al fresco. How many have I zapped with that electronic tennis racket? Last winter, we’d discovered a grey, papery nest the size of a basketball in one of our maple trees. It was almost dark, so I figured they’d be tucked into wherever they were living under the protective mulch. I fetched a shovel and poked around a bit and annoyed a few, so I retreated to get the can of bug foam and put them out of business. I stood about 6 feet away and covered the area with a blanket of white stuff. Just as I turned to go back inside, I felt a sharp poke on my middle finger, just below the knuckle. Hmm. Didn’t see that one coming. I’d been stung. Inside the house, I located the entry point. A bit of burning, a little blood. No visible stinger, though. I swallowed an antihistamine, dabbed on some antibiotic cream, thought nothing of it and went back to reading Robert Rotenberg’s Old City Hall. Ten minutes later, my flesh was on fire. My knuckle had filled with fluid and was swollen to the size of a grape. The back of my hand looked like a boiled ham. I slapped on a couple of ice packs and hoped for the best. Half an hour later, I could barely wiggle my fingers. Off to Shoppers Drug Mart, where the pharmacist recommended Benylin. I took two and went to bed. Next morning, my right hand had puffed up to the wrist, the skin so taut I could almost see myself in the reflection. Off to the walk-in clinic where a lovely young doctor said, no infection, take more antihistamines, but if I have trouble breathing, go to the hospital. Trouble breathing? Goodness. Three days later, the swelling hasn’t subsided that much, but it’s the itching that’s driving me mad. In the mornings, I wake up from my drug-induced stupor scratching. I’m caught in one of those pain-pleasure loops where it feels so good to scratch but when I stop, the pain rushes in on a tsunami of flaming pinpricks. Ice packs help dull the heat but that relief is temporary. A few years ago, a yellow jacket got under the sleeve of my blouse and stung me half a dozen times before I squashed it. My arm ballooned to the size of a two liter pop bottle. It’s remarkable that an insect smaller than my fingernail could inflict such lasting damage. I’m not insect-averse, as long as they stay in their territory – outside. But these little suckers are aggressive. The nest may be underground, but it’s in a dangerous place – we use the walkway to access the garden hose and I enjoy sitting on the porch to stare at the garden and plan next year’s renovation. If the bugs were bees, I’d have thought twice. Instead, I stared at my swollen burning hand mummy-wrapped in a tensor bandage and gel pack and plotted revenge. I zipped out to Home Depot and bought a can of another product. Last night, in the dark, I emptied half of the contents on and around the hole. There are still a few stragglers circling in confused circles around their former home. Unless it rains tonight, I’ll be out again to finish the eradication. 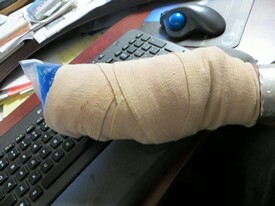 The inflammation in my hand will probably take another week to subside, though.